The story of Wolfgang Amadeus Mozart seen through the eyes of rival composer Antonio Salieri, who recounts his relationship with the young prodigy from a lunatic asylum he's been confined to - Mozart’s pure genius drove him literally nuts. This winning film was based on Peter Schaffer's 1981 stage play. 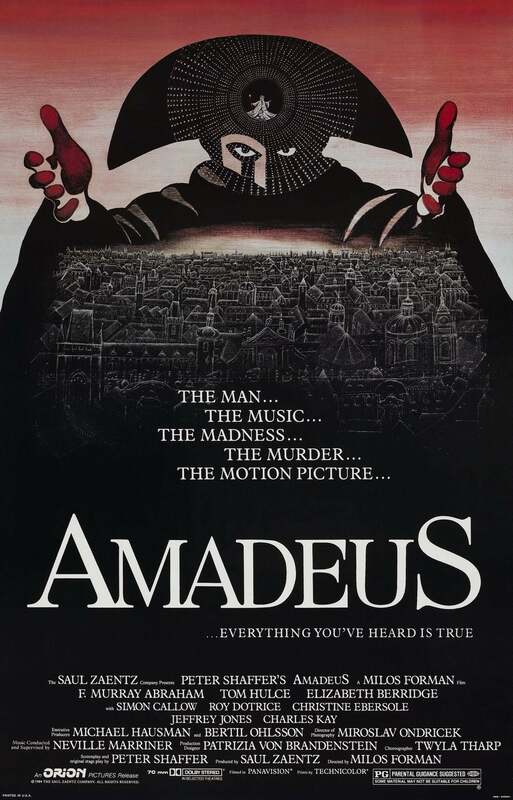 Amadeus won four Golden Globes: Best Film – Drama, Best Director (Milos Forman), Best Actor (F. Murray Abraham) and script (by the same Schaffer). Tom Hulce, who played Mozart opposite Abraham (Salieri), was also nominated for Best Actor, but lost to his older colleague; the same happened at the Oscars, in which Amadeus won eight awards. The 42nd Golden Globe Awards were held on January 27, 1985, at the Beverly Hilton Hotel. Raquel Welch and Michael York presented the Globe for Best Film-Drama of the year, confirming the forecast of experts and observers. At the Globes, the widely acclaimed Amadeus won over The Cotton Club, The Killing Fields, Places in the Heart, and A Soldier's Story. The film is narrated in flashbacks, beginning in 1822. Old and emotionally disturbed composer Antonio Salieri attempts suicide while apologizing for killing Mozart some 30 years earlier. He survives and is admitted to a mental institution, where he tells a young priest his tale of jealousy and mediocrity, eaten alive by his own envy. The film ironically helped spark a revival of Salieri's music, which had previously languished in obscurity. In another twist of irony, F. Murray Abraham won over Hulce both Golden Globe and the Oscar: “It's the only time Salieri beat out Mozart in anything,” he quipped when accepting the Globe. Forman's search for visual authenticity was appreciated: it was filmed on locations in the Czech Republic, Vienna (Austria) and Italy (Tuscany). Only four sets needed to be built: Salieri's hospital room, Mozart's apartment, a staircase, and the vaudeville theater where Schikanader (Simon Callow) stages a surreal comedy. All other locations were real. The performance of Don Giovanni in the movie was filmed on the same stage where the opera first appeared. Amadeus is one of only four productions to win both a Tony Award for Best Play (1981) and the Golden Globe and Oscar for Best Picture (1984). The other three are My Fair Lady (1964), The Sound of Music (1965) and A Man for All Seasons (1966).